The sadhana of Gayatri is worship of true knowledge. It has been repeatedly seen those who worship Gayatri will never be lacking in spiritual and worldly happiness. It is said in Taittriya Brahmana of Yajur Veda that each limb of Gayatri has been distilled out from each Veda.. The three fold knowledge was revealed: Rig to the heart of Agni; Yajur to the heart of Vayu and Sama to the heart of Aditya. Thus the All Pervading Lord revealed the three fold knowledge, the three worlds were thus illumined. The earth (Bhu Lok, Prithvi) by the Rig, the Antariksha (Bhuva Lok) by the Yajur and Dev Lok (Svah Lok) by the Sama Veda. Gayatri is Vedamatha, the mother of all Vedas. A person totally devoted to Gayatri recitation can achieve great success in the path of self advancement. Gayatri inspires man towards righteous wisdom. An astral, conscious electric current flows constantly in a person who is able to establish a relationship with Gayatri as it influences his mind, intellect, heart and inner self. No sooner the divine light of Gayatri dawns on the intellectual field of a person, the darkness of evil thoughts, false convictions, degrading vices start dispelling. Gayatri undoubtedly and miraculously transforms the mental framework of a person to a systematic, healthy, righteous and balanced personality. The well developed mind produces thoughts leading to action resulting in happiness. His work becomes excellent and his well intentioned thoughts radiate happiness, contentment and peace! Gayatri worship results in extraordinary benefits to its devotees. Numerous persons over thousands of years have achieved material and spiritual benefits by worshipping Gayatri. The reason is that they get righteous wisdom as a divine boon in the light of which all infirmities, complications and difficulties which make people unhappy, poor, worried and miserable, are solved. Darkness has no independent existence as it is nothing but absence of light. In the same way unhappiness is nothing but absence of true knowledge. Otherwise, in this righteous creation of God, there is not a particle of sorrow or suffering. God is sat, chit, anand, embodiment of supreme truth, virtuousness, existence and divine bliss. Man remains unhappy on account of his internal weakness for want of true knowledge. Otherwise, having been endowed with a human body which is scarce even for divine beings and living on this earth which is greater than heaven, there should be nothing else than pleasure for him here. The performance of Gayatri Japa serves as a preliminary rite for self purification, bestows on individuals Atma Shakti and protects them from the malefic effects of sins and expiation. Gayatri mantra is supercharged with power and has been prescribed to mankind under Vedic sanctions. A fresh order of life begins to blossom for all persons from the moment of initiation into upanayana, the sacred thread ceremony. The most cardinal part of upanayana is Brahmaopadesa, which is initiation into uttering of the sacred Gayatri Mantra. Enriched with divine energy, Gayatri mantra serves as a faithful protector for all those who silently utter the mantra to themselves with sincerity. This mantra is a dynamic force and enjoins the brahmachari (bachelor), the grahasthas (house holder) and the vanaprastha (forest dweller), all to repeat this sanctified mantra at least 108 times a day. Nithya Karma is one which is ‘niyata nimitta’ meaning ‘that which is done which is shastra bound’. Sunrise and sunset are the reason for doing Sandhya vandanam. Hence this is classified in the Nithya karma, which has to be done daily, lifelong. Naimithika Karma is one which is not shastra bound and not niyamic, i.e., a necessary duty, such as taking bath after an eclipse. Kamya Karma is one which is done with a desire to achieve, like a yagya for long life etc. Even if kamya karmas are not done , there is no papam. It is said to be started by Lord Brahma - for people of various Varnashram while living life may commit various types of intentional or unintentional sins, thus performing these oblations, they may be purified for sure. This oblation is quite beneficial that leads to Brahman alone. Before sunrise, in presence of stars in sky - this is the best time (उत्तम). Or, after stars hiding but before sunrise is better (मध्यम). And, after sunrise is normal - good (अधम). Before sunset, the best (उत्तम). After sunset but before stars appear - better (मध्यम). After sunset and that after stars appeared - good (अधम). His Holiness Sri Abhinava Theertha Mahaswamiji of Sringeri says whatever be the grade, it is always best to do it regularly. Otherwise, he warns, one’s Brahmanathva itself is wasted. The morning and evening sandhis are also ideal since, traditionally and habitually, a person’s stomach will be empty doing both sunrise and sunset. An empty stomach is achieved after four hours of a solid meal. An empty stomach is a prerequisite for Sandhyavandanam since there are at least three sets of pranayama totaling 15 in one full routine. A loaded stomach will interfere with pranayama greatly resulting in indigestion, sleepiness etc. Even the madhyahnikam (noon) routine is done with an empty stomach before the meal. Gayatri mantra is able to bring activation into the seven luminous bodies of our light body. Each of the individual syllables of this mantra contains a seed sound that resonates with the seven planes of light. As we regularly practice this mantra we build strength and vitality the divine energy within us that connects us to our divinity. Here the world of luminaries is superimposed having fire, sun, water and lightning as its purvarupa, uttararupa, sandhi and sandhana respectively. Fire is the first form, Sun is the second form, union of these two is water and the force or power that causes the union is the lightening (electric potential). We know a similar phenomena in Science. Hydrogen and oxygen combine to form water with the application of electricity. Hydrogen is a gas and combustible (characteristic of agni). Oxygen is a gas and supporter of combustion (characteristic of Sun - caused by temperature differences resulting in wind currents, supporting combustion). Water is the resulting union, caused by Electricity (vaidyutah) - the medium or power that helps in the union to form water. Water is a liquid and puts out fire. The two gases - Hydrogen and Oxygen - are combustible and supporter of combustion respectively. How did water, which puts out fire result from two gases which are combustible and supporter of combustion? That is the power in electricity. Science tells us here that it is the power of electricity, by which the kArya (water) is of a totally opposing characteristic from the kAraNa (Oxygen and Hydrogen - upAdAna). 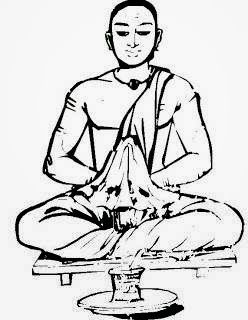 vEdAnta also presents that such a power exists - a power in Brahman. Brahman is of the nature of consciousness and limitless in space and time, and actionless, is the kAraNa for the jagat, which is of the nature of inert and limited in time and space. Such power of Brahman, which hides its characteristics of consciousness and limitlessness and presents itself as the inert limited jagat is mAyA. The root of Brahmin-form tree is Sandhya, all four Vedas are branches, Dharma and Karma are the leaves. Hence, the root must be protected with utmost care. If the root is destroyed, there cannot live tree, branches or leaves. Performing Sandhya at home counts one, at cowpen (गोस्थान) it counts hundred, on the bank of river it counts Lakh and that near Shiva it is of infinite fruit giving aspiration. āpaḥ punantu pṛthivīṁ pṛthivī pūtā punātu mām. punantu brahmaṇaspati-brahmapūtā punātu mām. yaducchiṣṭa-mabhojyaṁ yadvā duścaritaṁ mama. sarvaṁ punantu māmāpo'satāṁ ca pratigrahagg svāhā. agniśca mā manyuśca manyupatayaśca manyukṛtebhyaḥ. pāpebhyo rakṣantām. yadahnā pāpamakār ṣam. manasā vācā hastābhyām. padbhyāmudareṇa śiśnā. Ahasta-davalumpatu. yatkiñca duritaṁ mayi. idamahaṁ māmamṛtayonau. satye jyotiṣi juhomi svāhā. sūryaśca mā manyuśca manyupatayaśca manukṛtebhyaḥ. pāpebhyo rakṣantām. yadrātriyā pāpamakār ṣam. manasā vācā hastābhyām. padbhyāmudareṇa śiśnā. Rātri-stadavalumpatu. yatkiñca duritaṁ mayi. idamahaṁ māmamṛtayonau. surye jyotiṣi juhomi svāhā. May this water cleanse my physical body that is made of earthy substances. Thus purified, may the earthy body purify me. May this water purify the guardian of the Vedas, my preceptor. May the purified Vedas taught by the purified teacher purify me. (Or may the Supreme purify me. May the water purified by the Supreme purify me). My error, due to repast on prohibited food and misconduct if any, and the sin accruing from the acceptance of gifts from persons disapproved by the scripture – from all these may I be absolved. May the waters purify me. May Fire, Lord Manyu and the deities who control anger guard me from the sins resulting from anger. May the Day efface completely whatever sin I have committed on this day by thought, word, hands, feet, stomach and the procreative organ. Further whatever sinful deed has been committed by me, all that and myself I offer as an oblation into the Self-luminous Truth. May the Sun, Lord Manyu and the deities who control anger guard me from the sins resulting from anger. May the Night efface completely whatever sin I have committed during the last night by thought, word, hands, feet, stomach and the procreative organ. Further, whatever sinful deed has been committed by me all that and myself I offer as an oblation into the Supreme Light represented by the sun, the source of Immortality. My acharya Mayuram Sri Vasudeva Sastrigal use to say that one should not miss the sayam sandhyavandanam. If delayed due to any reason, it can be performed even up to late evening. If that is also not possible, one must do sayam sandhyavandanam immediately after getting up the next day morning (for the previous day) and then do trikala sandhyavandanam as usual. Sayam kala is moksharoopa. When a man gets moksha, he gets into sayam sandhya tatva and gets the real gnaana. Therefore, sayam sandhya is equally very important and has profound basis behind.